Killer Characters: Derringer Nominee--That's Me!! So I guess by now you heard that my cousin, Tommy Flood, got us into quite the escapade, all because Tommy ran into my sister Kathleen and while they were talking, her stuffed shirt boss happened along. Next thing we know Mr. Van Helden hires Tommy to keep an eye on his gorgeous, headstrong daughter. Not the kind of work we would normally do, but with the Depression and all, we did whatever we could to earn a buck. Believe me it gave us quite the look at how the other half lives—and it ain’t always pretty. Our author Terrie Farley Moran decided to write it all down in a story called “Inquiry and Assistance” so our adventure would never be forgotten. We were gassed when Alfred Hitchcock Mystery Magazine decided to publish it. Guys like Tommy and me would have no idea that each year the Short Mystery Fiction Society coordinates the Derringer Awards for short stories. You could've knocked both of us over with a pigeon feather when we found out this year “Inquiry and Assistance” is a nominee for Best Novelette. If you want to see for yourself all the fun we had, click over to our author’s website. You’ll find a free link to “Inquiry and Assistance” and you can learn all about those days and nights we spent with the swells. As to the outcome—well you’ll have to read it for yourself. 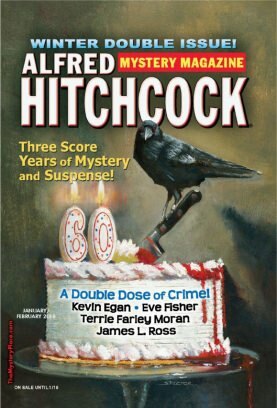 To celebrate our nomination, our author is giving away a signed copy of the January 2016 issue of Alfred Hitchcock Mystery Magazine. Yowza! To enter, please comment below and tell us how you feel about short stories in general, or “Inquiry and Assistance” in particular. Please include your email in this format: your name (at) your server (dot) com--so the spambots can't pick it up. Comments close at midnight on Friday, April 21st. I'm not entering as I have my own copy, but it's a great story! Congratulations on the nomination! I used to read this magazine and EQMM all the time. I like short stories every so often. There were some authors in EQMM that only wrote shorts. I grew up reading Ellery Queen mystery magazine. Loved the short mysteries! Short stories are a good way to try new authors. I enjoy reading short stories especially by authors that I'm familiar with. Also, great way to discover new authors. Congratulations, I never got around to ready these but always wanted to check them out. Though I prefer longer stories, I do once in awhile read the short ones. I am a fan of short stories. Unfortunately for me, the story would not download correctly for me. Well written short stories can create an atmosphere, characters and plot in fewer words. To me it means the author has to be very good at expressing ideas. Annette, I sent you an email with another link to the story, perhaps you can open that. I do enjoy short stories thank you. Oh Dianne, that is a shame. I have had a subscription for many decades and never had that problem. Terrible marketing practice!! Short stories are perfect for when my mind is on other things! CoNgRaTs on the nomination! I do enjoy short stories... sometimes I have a million things going on and it's nice to be able to start and finish the story in a short amount of time. I don't like getting vested in a story and then having to wait to read the rest of it at a later date. Giveaway is closed and the winner has been notified.